INN AT SEACREST 405: Beautifully Decorated Studio Close to the Beach!! This lovely studio is perfect for a relaxing romantic getaway. The top floor center studio features an extra large balcony to soak in the fabulous views of the gulf and overlooking the pool and hot tub. Imagine watching the sunset from the cozy patio sectional sipping a frosty beverage. The kitchenette has granite countertops and is equipped with a full sized refrigerator with ice maker, microwave, toaster oven, coffee pot, and blender. 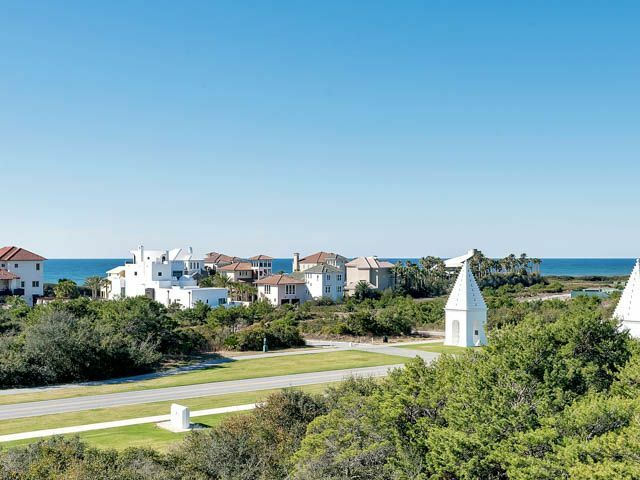 The charming Village with cobblestone lanes, slate roofs, gas lanterns, built in 2005 is located between Alys Beach and Rosemary Beach. Outside your door, the Village offers fabulous dining, shopping, biking, swimming, and is perfect for a fun-filled vacation or a long weekend get-away! * Three (3) night minimum stay. * Call us about this unit if you're looking for a last minute one or two night stay. Great location. The room and amenities were just enough for a getaway for two. We loved the balcony! The beaches were beautiful, and we will definitely be returning sometime! Thanks for your review. We think we have the best beaches! We look forward to your next visit. The place was beautiful! Very comfortable, clean and a beautiful view from the balcony! Great area! In between Rosemary and Seaside, so not congested with traffic like those areas! Easy access to beach! The room was perfect for two and beautiful view from balcony! Thank you for a great vacation! Lovely studio at a great value! We love this little studio condo. It is quiet and has a lovely view of the gulf. The perfect size for two! I. The hottest part of the day when taking a break from the beach, we have enjoyed sitting on the porch watching the traffic, riders, walkers and the water. I would recommend something in the room about where to access the beach and info on the tram (tip them), though we have chosen to do the five min. walk to the beach. Kitchen is stocked with anything you would need. The hot plate is a little tricky. This is a place we would love to return.